Conservatives have dominated most debates since Nixon. George Lakoff tells us how this has happened and how progressives should respond. Cover of Don’t Think of an Elephant! If you’ve ever wondered why your communication hasn’t cut through or resulted in the type of action you were after, Don’t Think of an Elephant! might be the book you need to read. Your organization has worked on an issue for a few years and you’ve had many setbacks. The opposing voices have dominated the debate and the media don’t seem to “get it”. You launch a campaign and find that it fails to change the debate or improve media coverage. In other words: you’re still losing. There could be a variety of reasons for this, but there’s a good chance you haven’t framed the issue correctly. Without realizing it, you may have framed your communication in a way that runs counter to your interest and reinforces the narrative of the other side. The fact is conservatives have dominated most debates since Nixon. In this short book George Lakoff tells us how this has happened and what progressives can do to respond. Lakoff has written extensively on language, linguistics and frames in other books, but this is his most accessible work. At 119 pages it can be read and understood in a few hours. 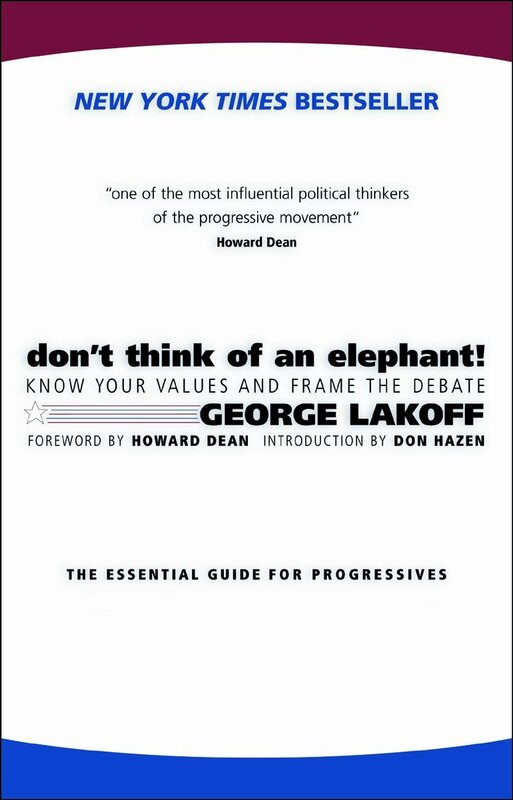 Lakoff highlights how conservatives have successfully framed issues like the “war on terror” and “gay marriage”; he digs down into how metaphors work and how they are used to activate support; he lays out methods and ideas for progressives who want to win debates and public support. Richard Nixon found that out the hard way. While under pressure to resign during the Watergate scandal, Nixon addressed the nation on TV. He stood before the nation and said, “I am not a crook.” And everybody thought about him as a crook. This gives us a basic principle of framing, for when you are arguing against the other side: Do not use their language. Their language picks out a frame — and it won’t be the frame you want. Let me give you an example. On the day that George W. Bush arrived in the White House, the phrase tax relief started coming out of the White House. It still is: it was used a number of times in this year’s State of the Union address, and is showing up more and more in preelection speeches four years later. When the word tax is added to relief, the result is a metaphor: taxation is an affliction. And the person who takes it away is a hero, and anyone who tries to stop him is a bad guy. This is a frame. It is made up of ideas, like affliction and hero. The language that evokes the frame comes out of the White House, and it goes into press releases, goes to every radio station, every TV station, every newspaper. And soon the New York Times is using tax relief. And it is not only on Fox; it is on CNN, it is on NBC, it is on every station because it is “the president’s tax-relief plan.” And soon the Democrats are using tax relief — and shooting themselves in the foot. It is remarkable. I was asked by the Democratic senators to visit their caucus just before the president’s tax plan was to come up in the Senate. They had their version of the tax plan, and it was their version of tax relief. They were accepting the conservative frame. The conservatives had set a trap: The words draw you into their worldview. The book is written primarily for an American audience. Lakoff devotes many pages to a concept labelled ‘the strict father/nurturant parent’ when describing conservatives and progressives. I don’t think this model works as well outside the United States. 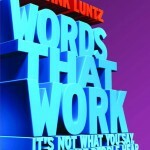 Despite this, the book is essential reading for anyone working on social issues and in politics — it is an excellent primer on language, metaphor, framing, and conservative strategy. 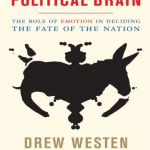 Communications professionals will need to delve deeper into Lakoff’s other works such as Moral Politics, Metaphors We Live By, and The Political Mind, and Drew Westen’s The Political Brain. Whilst Lakoff and Westen have written these books for people working in the political arena (with the exception of Metaphors We Live By) the theory, concepts and tools can be applied to any social issue. Wherever there is debate, divide, and discussion, these books can give progressives the tools they need to shift the debate, inform the public and media, and bring about meaningful change. Put Don’t Think of an Elephant! on the top of the book pile.